Payday loans are a short term loan you get to carry you until your next payday. Generally the amount loaned is $100-500 range. The loan is paid back when you get your next paycheck and you will owe a fee. The fees charged are essentially interest. Fees are HIGH. Its typical to pay $25 fee for a $100 loan which equates to 25% interest for a single month or 365% annual interest rate. There are also car title loans and cash advance loans. These are very similar to payday loans in how they work and are regulated. Car title loans will use your car title as collateral. Cash advance loans are essentially the same thing as a payday loan but not necessarily tied to your payday. ABC News reported on payday loans in the article: 391 Percent Interest on Fast Money: Worth It?. They talk about how payday loans can be a financial trap for people. Its typical for people to take a loan and then not be able to pay it back. The payday lender will then roll it into a second loan and you'll owe more fees. 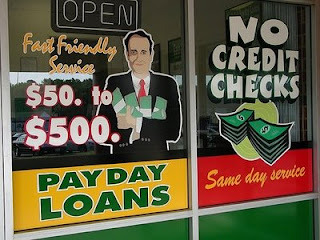 The payday loans are governed by state laws so what they can do will differ from state to state. Generally interest rates are very high and 200-300% range. Some places the rates can hit 500% or more. I did a Google search for 'payday loan' and the first hit was called Personal Cash Advance. I browsed through that site trying to find the interest rate and terms of the loans they offer. But I don't see anything quoting an interest rate. You can sign up and give them all your information to apply for a loan. They say they'll loan you up to $1500. They don't even tell you the interest rate. That is HORRIBLE. Nobody should ever sign up for a loan if they don't know the interest rate and terms of the loan in advance. Next site I found was USA Quick Payday. They don't quote an interest rate but they say what the fee is and the length of the loan. They say: "Your due date will normally be due on your next payday that is between 8 and 25 days away." "Our fees are competitive and in compliance with all applicable state and federal laws. Depending on the lender the fee can range from $25 to $30 per $100 borrowed. So if you borrow $300 the fee will be between $75.00 to $90.00." OK so lets say its $25 for $100 due in 25 days or less. So its about $1 /day interest. If you held that loan for an entire year then you'd be paying $365 on a $100 loan. Thats an annual interest rate of 365%. Payday loans are a VERY BAD way to borrow money and should be avoided at all costs. But you might be in a tight spot with no emergency fund and you need some money. So what should you do instead? * Sell some stuff. If you have anything on hand that you don't need and can sell then selling something to get some money would be a good option. * Seek terms from whoever you owe. If you're getting a short term loan then you are probably facing some bills or expenses. If you talk to the people you owe money to then they might allow you to pay in payments. * Ask your employer for an advance. I don't know how feasible this is with many employers but it wouldn't hurt to ask. * Find short term or temporary work. You might be able to get an extra job with a temp agency for a couple days and work it around your regular schedule. * Get a credit card advance. If you have a credit card with available credit then you can put your expense on the credit card or get a cash advance. Your interest rate will vary but will usually be under 30%. * Pawn something at the local pawn shop. The rates at pawn shops are better than payday loans. Plus if you can't pay the debt then they just keep your property as payment. The terms for pawning isn't great but its still a better alternative than a Payday loan. Interest rates vary depending on state laws so be careful. My state caps interest at less than 50% annually so its not a bad deal at all. But many states aren't that good. Another example from an article on pawnshops from HowStuffWorks cites a $2.20 fee on a $10 loan or 22% interest for 30 days, which comes to 264% annual rate. * Borrow from friends or family. You might have friends or family that can lend you some money short term. But be careful, you are unable to pay them back then it could hurt the relationship.